Are you intrigued or turned off by the title? Well I know if you’re like my bestie, you are not a fan of beets. But, my goal is to turn her as well as you into a beet lover for years to come. Remember, I’ve got that Roasted Beet Spread that is a sure fire win—even the Midwestern #shawsimpleswappers have given it a two thumbs up! Really, I’m going to keep it simple today folks. 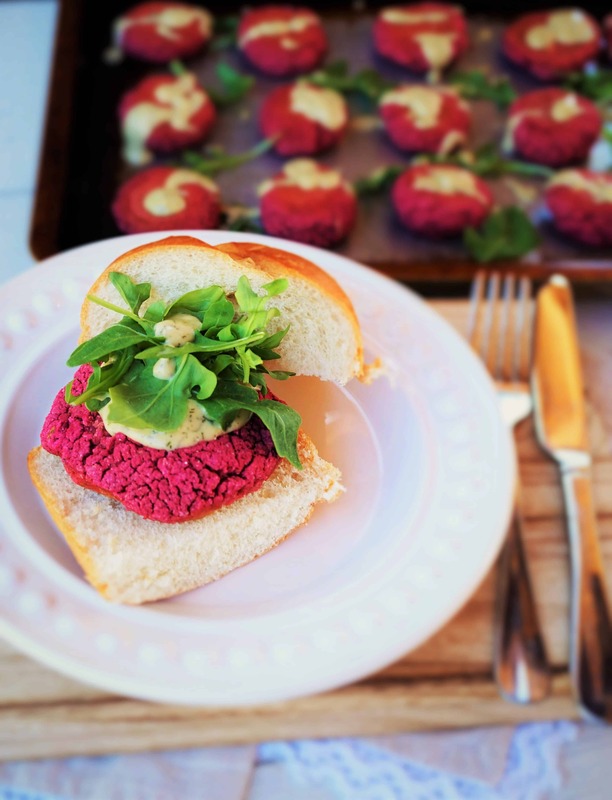 These Beet Falafel Sliders are simple, delicious, and need to be on your menu, stat! Filled with FOLATE, FIBER, MANGANESE, POTASSIUM… + MORE!! So, needless to say, I’m going to make a pretty bold statement here and say these babies are the new “3 day diet” clean eating cleanse! Yea, I know, #sexsells, but really these are more than just pretty to look at, they taste divine too. NO WAY! These are not made with beets?! Vegan, you’re kidding me right? I like these, I like them more than those beef burgers you made on the 4th of July. What’s that sauce? I like that it’s tangy! 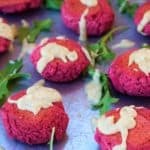 Alright, try these Beet Falafel Sliders and let me know what you think!! 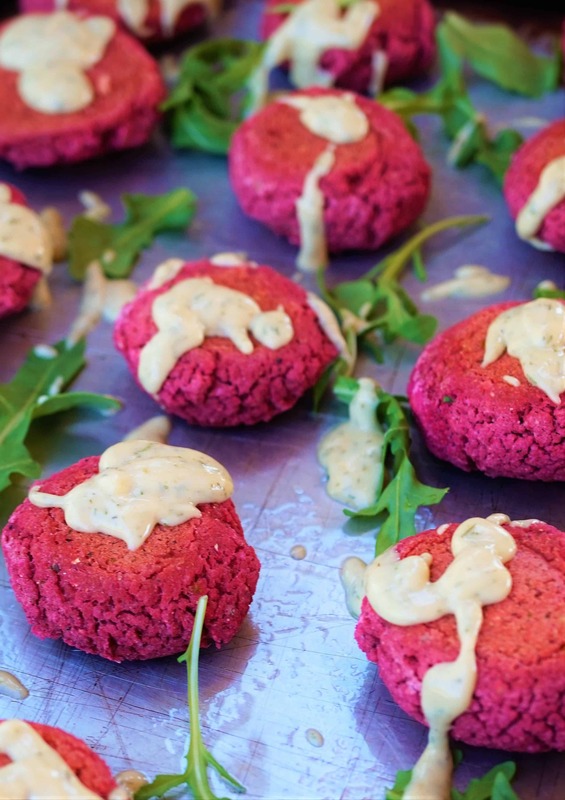 Pump up the BEET with these vegan, gluten free Beet Falafel Sliders with Dill Tahini Sauce! In a 12 cup (or larger) food processor fitted with a metal blade, add the garbanzo beans, beets, tahini paste, jalapeno, garlic and salt. Pulse for 4 to 5 minutes, slowly adding in the 3/4 cup of beet liquid from the can. Once a smooth consistency is achieved, add the masa flour 1/3 cup at a time into the food processor and continue to pulse until combined. Mixture will be thick and can easily be formed into patties. Line a baking sheet with parchment paper (or spray liberally with cooking spray) and portion dough into 1-inch balls. Press down using the back of a glass to make into circular patties. Bake 14 minutes, flip,and bake remaining 14 minutes. Remove from oven and let cool 5 minutes prior to serving. Add tahini, olive oil, vinegar, water, garlic powder, dill, black pepper and salt to a small bowl. Whisk until combined. Serve each on a bun topped with dressing and fresh arugula. Find the tahini on the ethnic aisle of your market. It's a ground sesame paste! Freeze patties for up to 2 months in a sealed container. Defrost on a microwave safe plate for 90 seconds, enjoy! Have you jumped on the beet train yet? What’s your favorite way to enjoy these beauties?! « Spicy Mustard Pretzel Turkey Meatballs + NFL Tailgate Eats! These are the cutest!!! Pinned! I think these sound amazing, and they look gorgeous too. Can’t get better than that color! 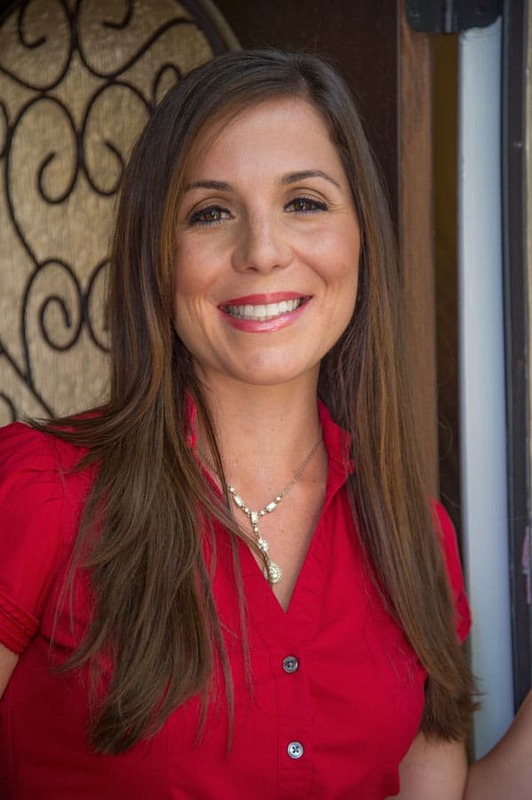 Way to go my friend! I know… even if it tasted bad (which I promise it doesn’t lol) the color gets me every time! These look so delicious! I cannot wait to make them. I know it says canned but I’m using these as my excuse to go buy another 18lb bag of beets at the market! Ah I love fresh roasted beets!!! Those are the best! I’m a HUGE fan of beets- these sound great! Can’t wait to try them Liz, love that sauce as well. Ah, thanks! I hope you enjoy! LOL- never never TMI with me :), glad they are so alluring to you!